Scratched your video iPod? Return it. Cat puked on your 5G iPod? Return it. Don't like last week's episode of Lost on your iPod? Go stuff yourself. 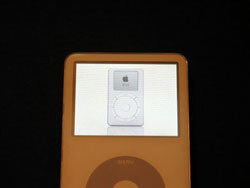 Apple is allowing the returns of fifth-generation iPods that show any sign of hardware failure (including general abuse) with no questions asked. A nice gesture, right? Kinda makes you reconsider signing up for the class action lawsuits—NOT! Because guess what? This new policy is only for Europe, Latin America and Asia-Pacific. No love for us here in the good old US of A. I guess Jobs figures we've got enough crap and enough cash that if something goes wrong with a 5G iPod, we'll just buy something newer. The official message to Apple's channel partners reads: "For a short period of time, Apple will be evaluating all forms of hardware failure on the recently announced fifth-generation iPod." Nothing specific mind you, but I guess this was just preemptive at this point. So, hey, if you're traveling out of the country and feel like trading in your nasty old 5G iPod, let us know how it goes.